Recover Data from all Database Files : master.mdf/.ndf/.bak/.ldf etc. 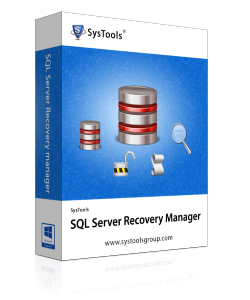 The SQL Server management toolkit offers you the option to recover corrupt database files. You can open and recover both SQL Primary Database file as well as Secondary Database file. The backup recovery module of SQL Server manager allows you to load and restore a corrupt or healthy SQL Server database backup file (BAK). The manager doesn't impose any kind of limitation on the size of the backup. Decryption of encrypted SQL Server scripts from Live SQL Environment can be performed with this manager toolkit. Once encryption has been removed from the script, it can be previewed before being exported. An overall activity log is generated by the toolkit. This log report can be seen on the main panel of the manager with details like: application name, file\database name, SQL Server version, Size (MB), & Date\Time. With the viewer module of SQL Server Recovery Manager you can load and preview corrupt/healthy master.mdf file without SQL Server environment. The MDF file can be of any given size, as no size limitations are imposed. Process an intact SQL Server Log database file & perform its analysis. All INSERT, DELETE, & UPDATE transactions carried out on the corresponding database can be viewed and analyze with the management toolkit. Both, Unknown as well as Empty passwords from SQL MDF can be reset with the toolkit. Password displayed as Unknown means the database is protected. While Empty means that you don't have the password and can login without a password. The software facilitates recovery of all data from all database files of SQL Server. The software recovers data like tables, functions, triggers etc from all SQL Server database files associated with it, like master.mdf/ .ndf/ .ldf/ .bak etc . The SQL manager supports all Microsoft SQL Server versions successfully. You can process database of / export database into, SQL Server of versions: 2000, 2008 R2, 2012, 2014, as well as the latest; 2016.